Say the words “bathroom safety” and what comes to mind? Grey, institutional surfaces? Harsh industrial lighting? A room stripped bare of design? Maybe once this was true, but bathroom safety is no longer just a concern in medical facilities. For millions of Americans with compromised mobility, it’s an everyday concern. And as our society becomes more aware of the needs of people with mobility issues, the number of creative and attractive solutions grows. 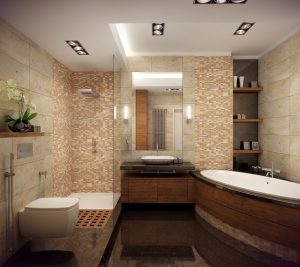 You can find hundreds of articles online about building a custom bathroom or remodeling an existing one to be safer and more practical all without sparing a single design detail. 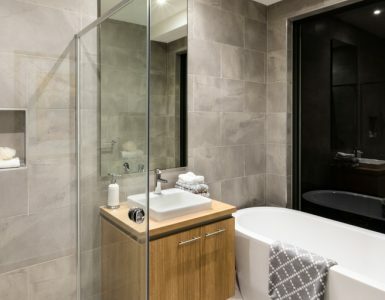 Drive makes bath safety products that can add attractive functionality to a brand-new bathroom, or fit right into the design scheme of your existing bathroom. Even for people without physical issues, the simple act of taking a shower can lead to injury. Add in mobility concerns and that risk increases. 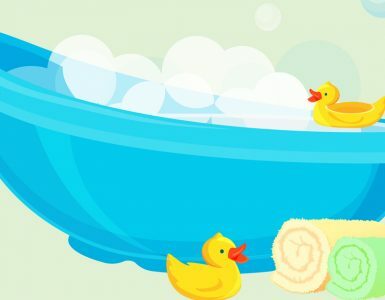 Soap and water mix to create slippery surfaces, and the heat and steam can be disorienting and cause dizziness. Many new shower stalls include a built-in seat, for both convenience and safety. The seat is also convenient for women who shave their legs and for making it easier to wash your feet. Even if you’re not up for a full bathroom remodel, Drive offers products that can make the shower safer. A shower chair features a sleek and elegant design along with great stability and easily-adjustable non-slip legs. The easy-to-clean seat comes in four colors to blend with or accent your décor, and the aluminum frame is corrosion proof, so your chair will look as good after one hundred showers as it does after one. Another attractive option is the teak shower stool The clean, modern look and natural teak of this convenient stool fits right in with a spa-style bathroom. Teak is known for its durability and weathering properties, taking on a lovely silver-gray patina as time goes on. Rubber tips on the bottoms of the bronze-toned adjustable legs prevent slipping, and the stool’s small footprint is ideal for use in a shower stall. 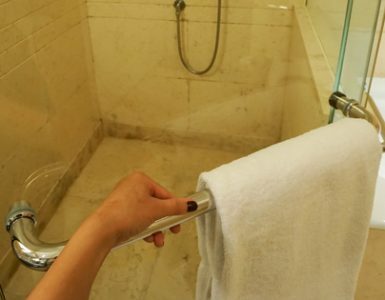 To go along with your bath seat or stool, a handheld shower head is a must. There are many versions available on the market, but not all of them have the features needed to work well for taking a seated shower. The hand-held shower head looks like something you’d buy at a specialty bath store but features an extra-long 84” hose and an on/off switch right on the shower head, for maximum control over your bathing experience. When getting in and out of the bathtub unassisted is impossible and a stand-up shower is not available, help is needed. The Bellavita bath lift does the job in style! In Italian, “vita bella” means “beautiful life” and what is more beautiful than freedom and independence? The Bellavita is the lightest bath lift on the market and also offers the lowest sitting position and highest maximum recline of any bath lift available. On top of that, its slim profile and white color helps it remain visually unobtrusive. Hygienic covers are available in white, blue, or grey, to coordinate with your bathroom décor, and the back folds down for space-saving storage. This vital piece of equipment makes bathing easier and safer while maintaining the residential look of your bathroom.